Thieves caught on security camera? What a fantastic thing! You may have heard many stories about thieves caught on home security cameras, hidden cameras or CCTV cameras, such as ghost caught on security camera in hotel, or at Disneyland. Sounds pretty creepy right? Of course, it is just a rumor. As you watch those videos about security cameras catching thieves online, have you ever wondered how thieves get caught on security cameras? How to trap thieves, burglars and trespassers with security cameras? Curiously? Now you can catch thieves with security cameras by following 3 simple steps. Thieves, trespassers, burglars and vandals seem to be multiplying at an unbelievable rate. Luckily, catching a criminal has never been easier with the help of security cameras. With 3 simple steps, you can catch a thief, an invader or an intruder with security cameras easily. When you use security cameras to catch a thief/burglar, one of the most important things is to make sure that you choose a right one from the top security camera brands. 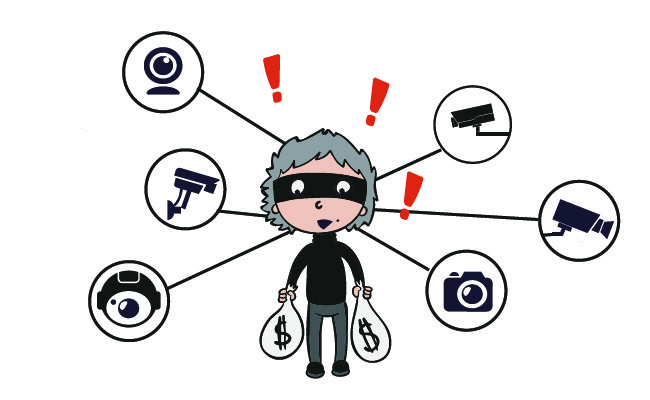 There are several tips to help you quickly decide a suitable security camera to catch a thief. Tip 1. Over 65% burglaries happen in day time, but you can neglect your home/business security at night. How to catch a thief, burglar or vandal at night? You should invest in a security camera with night vision. The infrared LEDs of security cameras enable long night vision distance, which allows you to view crystal clear videos/images in low-light conditions. Thus you can catch thieves both day and night. Tip 2. When you install your security cameras for your front door, porch, garden or other outdoor areas, you should purchase waterproof security cameras. An IP66 waterproof security camera is a good option. Note: IP is the abbreviation of ingress protection. IP66 security cameras means that security cameras can protect the inside structure from high pressure water jets from any direction. Tip 3. Choose a HD (high definition) security camera. There are 3 popular security cameras in the market: 1440p (4MP), 1080p (2MP) and 720p security cameras. 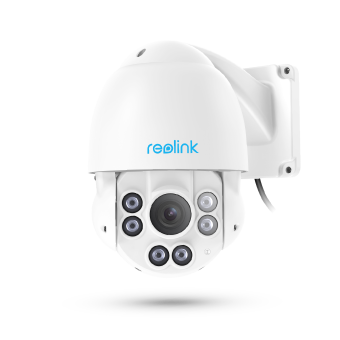 If you want to catch the thief/burglar’ face clearly and his license plate number (if he drives his car), 1440p (4MP) security cameras with zoom function are your best choice (such as Reolink RLC-423 PTZ security camera, it is equipped with these 2 functions). You can zoom in and out to view more image details or have a wider viewing angle. With the evidence captured by your home/business security cameras, the police can help you locate the bad guy more easily. Tip 4. Purchase security cameras with remote access. When you need to know what is happening to your home or business, you can use your iPhone, Android smartphone or any other mobile device to access your home and business remotely. Tip 5. Some of you may pay attention to the price. A high quality security camera is inexpensive nowadays. There are many high quality security cameras under $100. You will find a suitable one to catch a thief and secure your home/business. Well, after you purchase suitable security cameras, the next step is to install your security cameras properly. You can get some insights in the below chart on where to install your security cameras. From the chart, you can see that 34% of burglars enter through the front door, while 22% of them access homes though a back door. Thus you need to install more cameras to secure your front door and protect your home back door from break-ins. Besides, some of you may ignore the security of garage and second floor (definitely DON’T). Those criminals would use your neglect to their advantages. 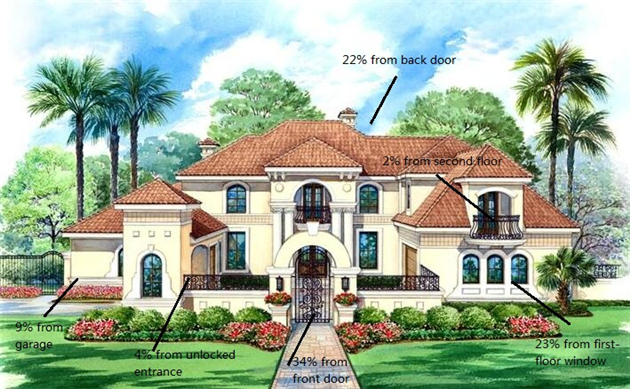 All in all, you should keep all possible entrances secure from any would-be thieves or burglars. Security cameras work only when you put them into use. Thus, you need to keep your security cameras running to catch rampant thieves, burglars, vandals, etc. Maybe it sounds like nonsense, but some people would sometimes forget to run their security cameras. I am here just to give you a kind reminding. To catch a thief in the act with security cameras, you need to set up 24/7 continuous recording or motion detection recording and motion detection alerts. Before you use these functions, make sure that you have configured these functions properly with the client software and app (often provided by security camera companies). For 24/7 continuous recording, a PoE security camera system or a WiFi security camera system is your best choice. Videos are recorded in the NVR without occupying your computer’s memory. Besides, if you want longer recording, you can try motion detection recording. Of course, all standalone security cameras can do both 24/7 recording and motion detection recording. No matter which type of security camera (system) you prefer, it can catch thieves/vandals effectively. Remember to set up motion detection alerts when you use security cameras to catch thieves or burglars. Whenever a danger is detected, the surveillance video camera will trigger alerts by immediately sending alert e-mails and pushing notifications to your smartphone or other mobile devices. It also uploads and saves captured images/videos to the FTP server. Once you receive the push notifications, you can call the police immediately. 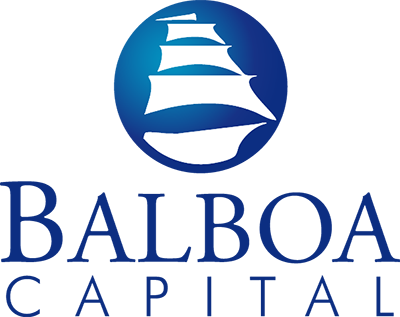 Thus your future loss can be prevented, and the criminal can be caught as soon as possible. Only 3 simple steps, you can set a trap to catch a thief with your security cameras. You will find that catching a thief/burglar is as easy as making a phone call. If you have already installed security cameras for your house and business, keep digging for more powerful functions of security cameras; if not, what are you waiting for? Just go to buy one now! The future benefits of security cameras are worth your money! Some of you would doubt the effects of security cameras on catching thieves, why not view some cases below to see whether security cameras are really workable to catch shoplifters and thieves? You can also search relative videos about a thief caught on cameras on YouTube or Dalilymotion. If you run a shop, be careful of shoplifters. 10 India and Pakistan women thieves were caught by security cameras for stealing in a shop. (You can watch the video on YouTube.) Besides, Winnipeg store security camera catches thieves in the act. Mind your bad neighbors! A home security camera catches a woman thief stealing from front porch. The woman lives just near the victim. You can view the video here. Gift thieves, bike thieves, car thieves, package thieves, ATM thieves got caught on cameras. Credit card thieves got caught on Walmart security cameras. All these facts all prove that security cameras are one of the best ways to catch a thief, burglar, vandal, larcenist, etc. Thanks to security cameras, these criminals are put in jail by police. By the way, if you have videos that show thieves, burglars, ghosts (just kidding) or whatever creepy stuff caught on security cameras, why not share with us by posting the videos on our forum? I’m definitely sure that your awesome videos will surprise us all!